Municipal inspectors have photographed flying objects hovering next to telephone antennae. Claudio Heredia is the Municipal Inspector of Tornquist. During his outine assignment - surveying communications and telephone towers - something unusual drew his attention. 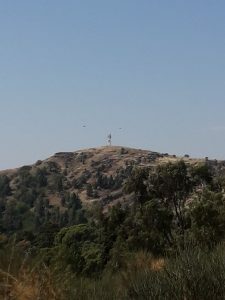 A cellular telephone tower sits atop a summit near Villa Ventana. Heredia and another employee were tasked with photographing and surveying the towers throughout the entire district. When Heredia took the photo and saw it in his cellphone, he noticed two objects that caught his attention and which he did not see when pressing the shutter. At first he thought the lens might be dirty. The faint objects can be made out despite the distance, which he estimates at some 1500 meters (4900 feet). Villa Ventana, Sierra de la Ventana and Tornquist have been in the news repeatedly due to maniestations of unidentified flying objects. The photos will be submitted to UFO experts for their analysis, to see whether or not UFOs are involved.